I hope you had a wonderful holiday, and even more so; I hope you are excited about the New Year ahead. Whether you believe in setting resolutions or not, January has an energy of freshness and new beginnings. The sun is returning, and balance yearns to be restored. January wind whispers, or howls, to us to let go of those things that no longer serve us. Unfortunately, New Year’s Resolutions often focus around our weight. When weight loss is the sole goal, and we turn to calorie counting, deprivation, and restriction, we set ourselves up for failure. Any time we take an adversarial approach to something, we attract more of what we don’t want. 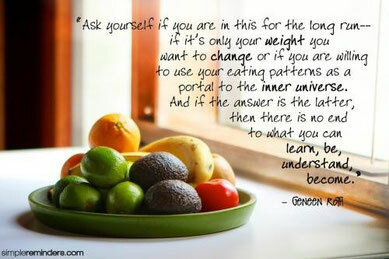 That principle applies to our bodies, and our weight. If weight loss is on your resolution list, take some time to consider your motivation. If you have excess weight (or shall we say excess adipose tissue) it is your body’s way of speaking to you. It may simply be saying the foods you eat aren’t supporting you, but it can also be sending you information about your adrenals, thyroid, liver, insulin levels, toxicity, and so much more. Weight loss becomes a side effect of addressing these deeper issues and restoring balance and health. Please forward this to anyone you know who may be considering getting on the dieting roller-coaster this month. The weight loss industry is a billion dollar industry and it irks me enormously this time of year to see them preying on us post-holiday! If diets worked, they would not be in business! Some diet companies get creative and count points instead of calories, call it a lifestyle change, etc., but don’t be fooled: they are diets. Until root issues such as the ones mentioned above, and the emotional reasons behind our eating are addressed, we won’t be successful in shifting to a healthier weight. For those who are ready to do what is needed to get healthy in 2016, and trust our bodies to naturally attune to our ideal weight as a result, consider an individualized approach through my nutrition and wellness coaching, and not a cookie cutter diet. It isn’t always easy to go deep to the roots, but for those that are ready, imagine the possibility of creating something new this year.